informal adult learning by the Department for Innovation, Universities and Skills. Palomar5 Education organised a small, conspiratory event in reponse to Sir Ken Robinson’s call to bring on the learning revolution, a great opportunity to get some glimpses of how we will learn in the future through the lenses of Basti Hirsch, who went on a five-week education expedition through the United States; Aron Solomon, who is busy creating a boarding school with wheels, the Think Global School; and Margret Rasfeld, who founded a protestant reform school in Berlin. What have I seen? 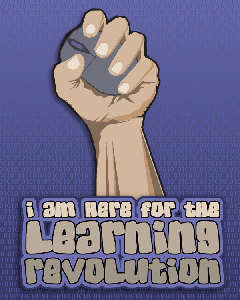 I am here for the learning revolution. And you? Photo by wfryer on Flickr. I have seen three very different approaches to and understandings of learning and education by people who share the belief that—while public education remains a fundamental cornerstone of democratic societies—much of what happens in our institutions of formal education is wrong and represents a broken system. Many of these shared principles, I would guess, are key to most of the innovative education endeavours I know. Add to the list and share what you think in the comments! Admittedly, this list is generic—quite possibly, too generic—but it’s a start. Wir fangen schon mal an.